The next blog posts I'll be covering, when time permits, will be Captain Midnight and the Shadow, both characters with roots in old time radio. 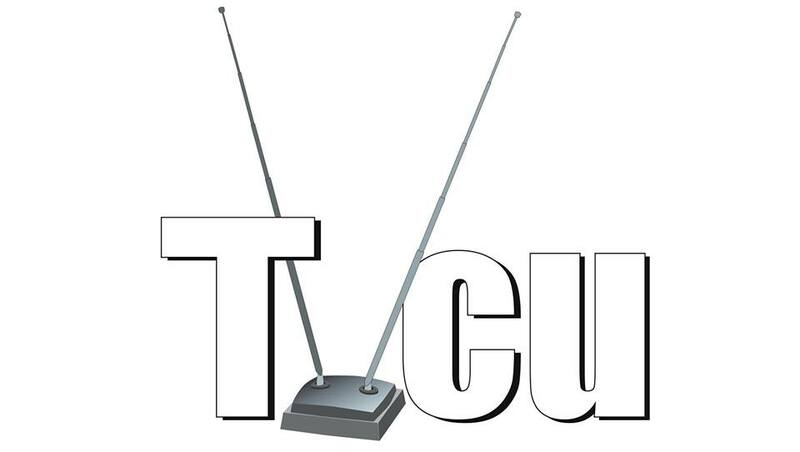 The TVCU website doesn't cover radio often, as it's technically not on-screen, but it is a precursor medium that involved voice actors. I have previously covered some old time radio in my posts on the Green Hornet and Superman. With the Shadow, who has A LOT of crossovers already covered by a "crossoverologist" elsewhere, I may just stick to Shadow crossovers with other radio, television, and/or film series. 1914 to 1918--The main era of adventures of G-8. February to June 1916--THE ADVENTURE OF THE PEERLESS PEER--Holmes teams with Tarzan. 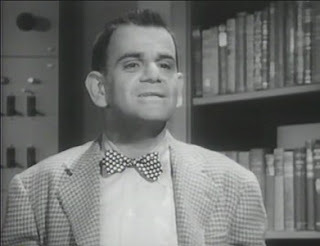 Other crossover connections are: THE SHADOW, G-8, ALLAN QUATEMAIN, SIR HENRY MERRIVALE, and DR. GIDEON FELL. 1917--DAREDEVIL ACES--"Dynamite Cargo"--G-8 meets the Red Falcon. 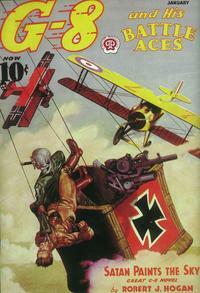 Winter 1918--DARE-DEVIL ACES--"Flight of the Vultures"--The Red Falcon is assisted by G-8. 1918--G-8 AND HIS BATTLE ACES--"Fangs of the Sky Leopard"--G-8 again teams with the Red Falcon. 1918--G-8 AND HIS BATTLE ACES--"Red Wings for the Death Patrol"--The third team-up between G-8 and the Red Falcon. 1918--G-8 AND HIS BATTLE ACES--"Red Wings Raiding"--The final recorded team-up between G-8 and the Red Falcon. Summer 1921--TALES OF THE SHADOWMEN VOLUME 2: GENTLEMEN OF THE NIGHT--"A Jest, To Pass the Time"--A mystery man sends several thieves off to find the legendary Moonstone. G-8 has a crossover. Too many others. Win Scott Eckert's Crossovers: A Secret Chronology of the World painstakingly reveals every crossover in the Tales of the Shadowmen series. November 1931--CAPTAIN MIDNIGHT--Red Albright (aka Bruce Hagin Rassendyll) begins his new adventures as Captain Midnight on a fairly more regular basis, with Chuck Ramsay, Patsy Donovan, Joyce Ryan, and Ichabod Mudd, who Win Scott Eckert believes to be an ancestor of Star Trek's Harcourt Fenton Mudd. 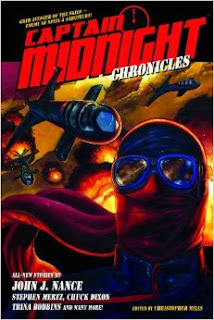 Early 1930s?--CAPTAIN MIDNIGHT CHRONICLES--"Death Master of the Secret Island"--Midnight uncovers an island that may have been inhabited by an ancient Cthulhu cult. March 1937--CAPTAIN MIDNIGHT CHRONICLES--"Captain Midnight at Ultima Thule"--Midnight battles the German pulp hero Sun Koh with revelations of a link to ancient Opar! Other crossovers linked in this story include: SKYLARK, THE COMING RACE, G-8, LANCE STAR, FU MANCHU, ARSENE LUPIN, THE WORKS OF PHILIP JOSE FARMER, KING KONG, SHERLOCK HOLMES, OPAR, and TARZAN. Note that the "Wold Newton Universe" is not the Television Crossover Universe. 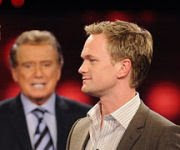 There are some stories that fit within both shared realities, but there are some contrary methodologies between the TVCU (and its published counterpart, the Horror Universe) and the Wold Newton Universe (and its published counterpart, the Crossover Universe). We tend to include things here that might get relegated to alternate realities in Eckert and Sean Levin's crossover works. It makes since, as Eckert's Crossover Universe begins with Farmer's work at its center, a more pulp/victorian literature focused center. While we include that type of work, based on our methodology, the TVCU's center is "Lucy meets Superman", and the Horror Universe centers on Abbott and Costello Meets Frankenstein, so we often allow for a more surreal, sillier reality. While the WNU/CU is the secret history of the world outside your window, the TVCU is absolutely not the real world, and is the world seen on screen. But as I said, there are many stories that fit in both, including published stories that adapt the Farmerian method, and as a completist, and thorough researcher, I must adhere to my crossover methodology and include theories that make it into published works and deem them as official for TVCU purposes. Out of respect for the crossover research of Eckert and Levin, certain entries that have A LOT of crossovers, particularly if they are not TV/film related, I choose to only briefly mention the story synopsis and list the crossovers involved, but not go into too much detail on the specifics of the crossovers. Eckert and Levin have some fine books and websites that go into much greater detail on pulp and victorian literature crossovers. I'll stick to talking about mostly on-screen stories, my area of expertise. December 1940--AIRBOY!/G-8--This crossover is the first meeting of Airboy and G-8, but the later Airboy/Midnight crossover seems to make them seem like a first meeting. Perhaps that was an intentional mislead from Midnight to not give away his previous identity. G-8 became Midnight allegedly in 1918. Perhaps Midnight maybe occassionally slipped between identities, just as he sometimes returned to his Midnight identity during his Jet Jackson era. 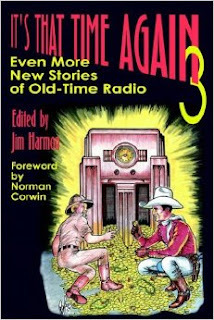 December 1940--IT'S THAT TIME AGAIN 3: EVEN MORE NEW STORIES OF OLD-TIME RADIO--"Jack Armstrong and the Hoard of Montezuma"--Jack Armstrong on an expedition to find Montezuma's treasure. 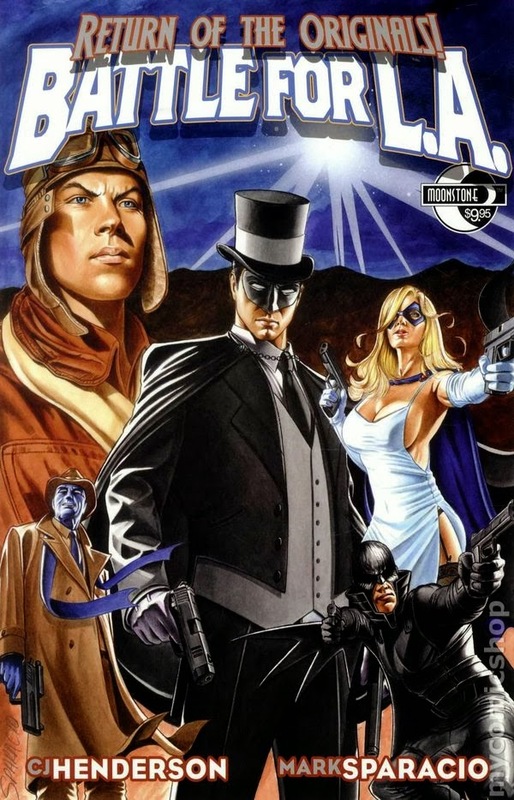 Other crossovers include: CAPTAIN MIDNIGHT, NICK CARTER, SHERLOCK HOLMES, THE SPIDER, THE GREEN HORNET, and DON WINSLOW. 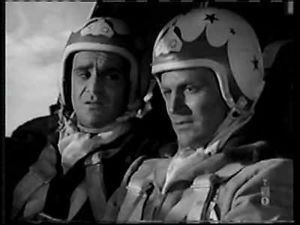 Early 1940s?--CAPTAIN MIDNIGHT CHRONICLES--"Captain Midnight Meets Airboy"--The two legendary pilots work together. 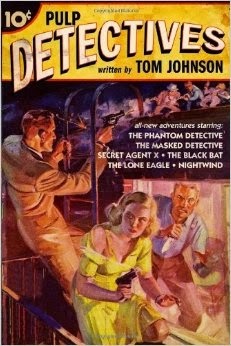 1942--PULP DETECTIVES--"The Nazi Spider Staffel"--This Lone Eagle adventure has crossovers with: SECRET AGENT X, HOGAN'S HEROES, G-8, and THE PHANTOM DETECTIVE. World War II--RETURN OF THE ORIGINALS: BATTLE OF L.A.--G-8 teams with THE PHANTOM DETECTIVE, THE BLACK BAT, and THE DOMINO LADY. SECRET AGENT X is also involved. 1954 to 1958--CAPTAIN MIDNIGHT--Captain Midnight was a daring, jut-jawed war hero who led a mysterious government group known as the Secret Squadron. Midnight, his comic sidekick Icky, and the rest of the Squadron traveled around the globe stomping out evil. When the show went into syndication, Midnight's name became Jet Jackson, and the show's title was changed. Winter 1971--IT'S THAT TIME AGAIN--"Any You Walk Away From"--Captain Midnight teams up with Sky King. Summer 1990--THE SPIDER'S WEB: STARRING WEB-MAN--"The Web of Time"--G-8's foe, Herr Gunn, travels from 1918 to the future to encounter Web-Man. 1998 to 2001--THE FAMOUS JETT JACKSON--After having spent years in California working as the TV action hero Silverstone, Jett Jackson decides to move the show to his hometown in hopes of pursuing a more normal life. 2000--PLANETARY: ALL OVER THE WORLD AND OTHER STORIES--Archaeologists discover a hidden history of extraordinary beings, including DOC SAVAGE, FU MANCHU, OPERATOR # 5, TARZAN, TOM SWIFT, G-8, THE SPIDER, GOJIRA, MOTHRA, GHIDORAH, and more. 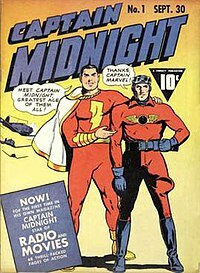 2000--RADIO'S CAPTAIN MIDNIGHT: THE WARTIME BIOGRAPHY--Author Stephen A. Kallis publishes the biography of Captain Midnight. 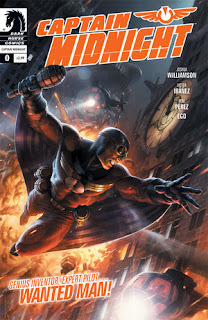 21st Century--CAPTAIN MIDNIGHT--Captain Midnight returns after having been trapped in the bermuda triangle since World War II. Only... Midnight had adventures after that, all the way up to the 1970s. But it's the Bermuda Triangle. Remember that story where Han Solo and Chewbacca crashed on Earth and died, and we said that going through a time/space portal created a "transporter duplicate" of sorts? Perhaps this Captain Midnight popped out of the Triangle sixty years later while another version of him came out moments later. We also used this doppelgangers in the same timeline for the Munsters/Munsters Today explanation. June 2001--JETT JACKSON: THE MOVIE--Jett decides to quit Silverstone and lead a normal life. On the day of his last episode he is hit on the head with a prop and in his dream he is Silverstone. He is the only one who realizes that this is a dream. 2007--THE FLYING SPY: A HISTORY OF G-8--A biography of G-8 is written by author Nick Carr. SKY CAPTAIN--Sky Captain was inspired by Captain Midnight. Since Sky Captain doesn't fit in the TVCU (for instance, Godzilla attacking Tokyo in 1939), it could be that Sky Captain IS Captain Midnight of this alternate timeline.